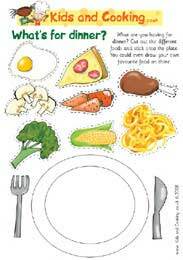 Have a go at cutting out all the different foods in this picture and stick them onto the dinner plate. You could even draw your favourite food on there! Why not Download the What's For DInner Cut Out Pictures right now and see what you fancy to eat! This activity is aimed at 3 to 7 year olds, it's a fun way to help children learn a little something about food and cooking, as well as building their creative and recognition skills.